Well the last Hot Fun In The Summertime party is here. It's been really fun seeing what you guys are doing for fun this summer. If you haven't checked out last weeks features you'll find them here. Then, come hang out in my back garden with me under my new pergola, and let's get this party started! Be polite and be a follower of your host...or ALL the hosts if your super duper polite! Check out some of the other entries. Their inspiration might be your next great project! Enter a few times, but don't be a party piggy! Have a wonderful weekend. I now have a new mission! Yea! You made me chocolate chip cookies? You shouldn't have, but I would be right over if I lived closer. Your garden looks so pretty and green. Love that new pergola. You are so talented! And I can tell you're a really good cook. Your outdoor room is blowing me away! This belongs in a magazine. I am loving every single detail of it, and as soon as I clean out every last piece of furniture, I am copying this. Thanks for such a fun party. Heading over to Pinterest now! Oh for Pete's sake! You are so clever and creative. LOVE the pergola! 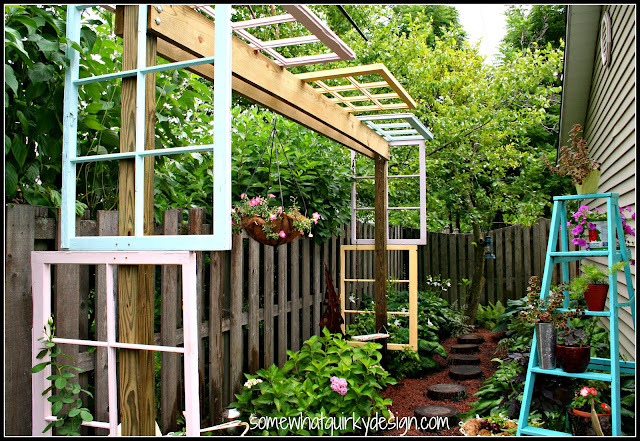 Adore your Pergola!! Thanks so much for hosting such a great party series! omg, this is adorable! you know my love for old window sashes,this just totally makes me smile!